In his ‘unplayable’ play, What Century?, Frank O’Hara opens with a stunning and implausible series of stage directions: ‘Waves breaking like bees on the shelf of Armorica, while the scent of burning almond leaves fills the nippled sky. All elegance seems to have set aside its mask so that the wandering troubadour in his coat of many colors, unlike the sunset, feels at home across the several seas and stays everywhere semi-permanently…’ The poet ends his monologue: ‘to be alert is to be decorative. Winter.’ There is an odd weighting to this statement; it hints at, though doesn’t entirely seem to be, interchangeable with the alternate statement: to be decorative is to be alert. And even then, his sensual preamble, with all its lyrical reverie, doesn’t exemplify his conclusion that action can be equated with ornamentation, or feeling with form. It appears more as a notion. As a stage direction, these poetic images require embodiment and physicalisation. 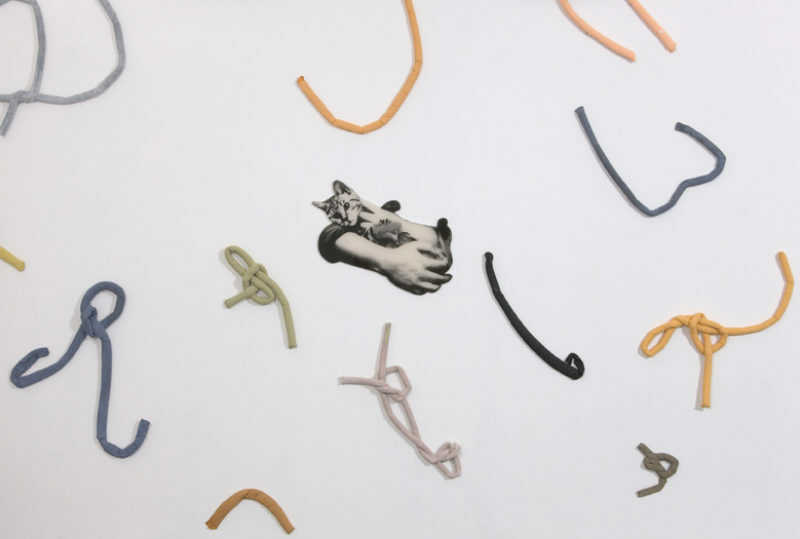 Laura Aldridge’s exhibition of new work, Cats are not important, exploits a similar slippage between evocation and representation, sensual forms and image. The show’s title appears as a primer to the artist’s contradictory intention; in Aldridge’s declaration here too is the implication of the interchangeable: cat’s are (not) important. A triptych of wall-mounted screen prints on Perspex depict the titular animal, cradled and petted in a pair of outstretched arms. The title of the series, ‘Hand extended’, has the ring of an instructional manual, while the images, devoid of any supporting context, demonstrate only the human experience of tactility. The cat appears as an object of domestic desire and unknowable agency. Here, and throughout the exhibition, Aldridge fuses subject with object, and collapses the representation of sensual experience with real sensuous forms. Riffing on the idea of décor and interior as psychic interiority and interior design, the gallery ‘plays’ the role of domestic space. The installation-based practices of Marc Camille Chaimowicz and Marcel Broodthaers are informative, though not derivative, influences here. 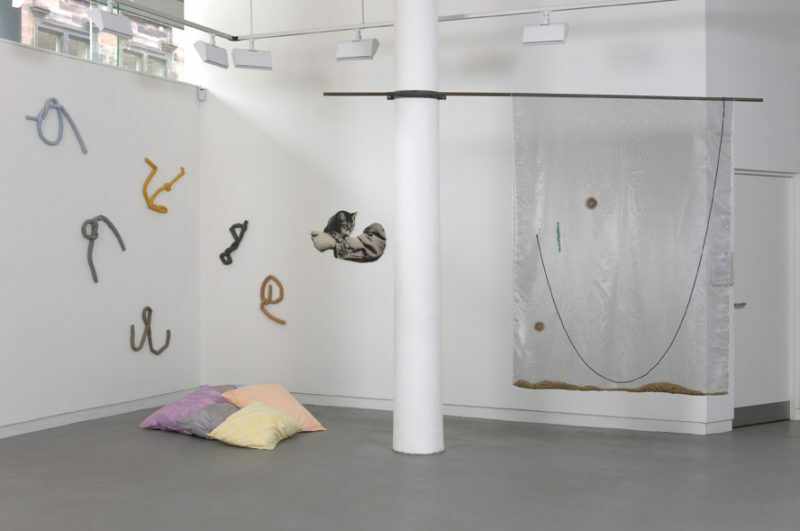 Aldridge confidently dots the room with vibrant, hand-dyed floor cushions (which she titles ‘Stones’), and punctuates the gallery walls with long sausage-like socks that have been filled with wet plaster, folded and then dried into playful curlicues and arabesques. Thickly painted in pastel hues reminiscent of a Rudolf Steiner colour scheme, these objects carry both a voluptuous, sodden wetness and a fragile brittle quality. The wormy shapes, like clustered phrases, exhibit and abstract the hand of the artist. Elsewhere, fabric emblems hang from poles or are draped over walls. A lightly scumbled central plinth displays a series of hyper-saturated photographic prints: tourists gathering at the mouth of a cave, the face of a young woman with two fingers dipped into her mouth. Interspersed with these are wide vases filled with melons and limes floating in water; interior slides between bodily orifice and decoration. The bourgeois symbolism of decorative fruit, oversized flower vases, potpourri, appears not as a series of props but as ciphers within a holistic environment that plays out the idea of private leisure. Aldridge’s lightness of touch not only evokes, but also seeks to complicate, the argument that design can dictate people’s desire. The show’s sensitivity to form, touch, and sensation does, however, at a single point, exhibit a rare aggression. In the photographic portrait, the fingers of the woman gesture towards a gag reflex—an emphatic bodily rupture in an otherwise seductive environment. This dissenting gesture motions towards an indexical form of representation, where the image decisively moves away from the mere craft of the hand towards a darker and perhaps more direct form of visual communication. With its double-edged sensuality and sickliness, this photograph is the maverick here, finding a way to escape the crafted rhetoric of neighbouring objects that often simply appear beautiful. Aldridge’s ambition to develop physical forms that embody her intention is keenly felt, although not always fulfilled. Ludic visual metaphors are skilfully tossed about the room, but their translation beyond the hermeticism of this exhibition is occasionally harder to grasp. Representation is muddled with material, and the internal language of the work is never entirely open to the viewer. Instead, one grapples with hints and rhythms within the tableaux, where objects shift between living and staging, leisure and work, privacy and exhibition. Within such opacity, there is a strangely lyrical poise and an osmotic movement from feeling to form.